Apple officially supports mix-and-matching Obj-C and Swift code in same xcode project. When you create a first ObjC in a Swift project or vice versa. 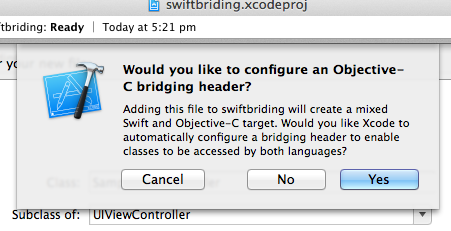 Xcode ask your permission to create a special file called Bridging Header. If you say Yes, xcode silently creates a new header file named YourProjectName-Bridging-Header.h and add to your project. If you observe it also modifies your project (.pbxproj) file. How to add the Bridging Header file manually? You can say No to xcode dialog for adding bridging file and still add the file manually. Bridging Filename should follow the same convension used by xcode? While searching answer for this question I found that the bridging file has to be added to your project’s main group not under any other group. Eg., I try to add bridge.h to subgroup and got the error. Remember the three configurations added by xcode? when you set the Objective-C Bridging Header it add the other two (Enable module and Optimization level) without any additional steps. Check whether you had included the ObjC class you use is added/imported in your bridge.h file. What is happening in build process? Here is the screenshot of build steps with bridging and without bridging. I’ve noticied that it failed when compiling the .m file which uses the swift object. So I was curious to see whether the CompileC is passing any additional argument when you provide a bridging file. To my surprise, the compilec is identical for both. 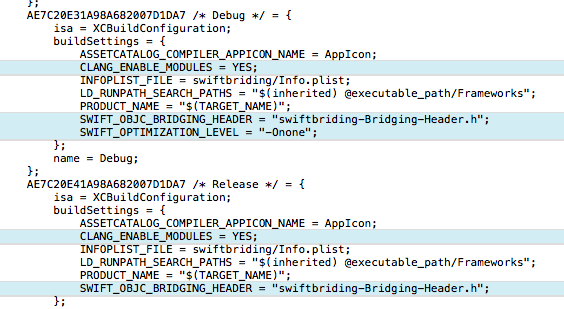 I believe, the Compile Swift source files step does the necessary magic by linking/exposing the swift files to objc. Is there any difference in adding bridge file to a ObjC project / Swift project? I have noticed only the project name is the only variable in this dialog. How to use ObjC classes in Swift project? How to use Swift classes in ObjC project? Import the yourprojectname-swift.h in your ObjC file where you need to refer the swift classes. You do not have to create yourprojectname-swift.h file, the compiler will be creating the same in build phase.